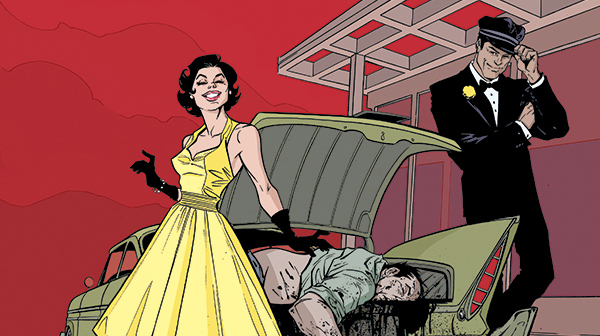 LADY KILLER #2 Review | Warped Factor - Words in the Key of Geek. Gail Williams checks the trunk. 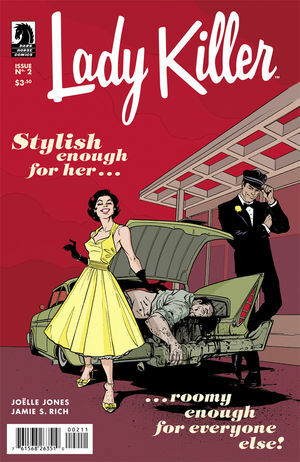 Josie’s life grows more complicated than ever in Lady Killer #2. 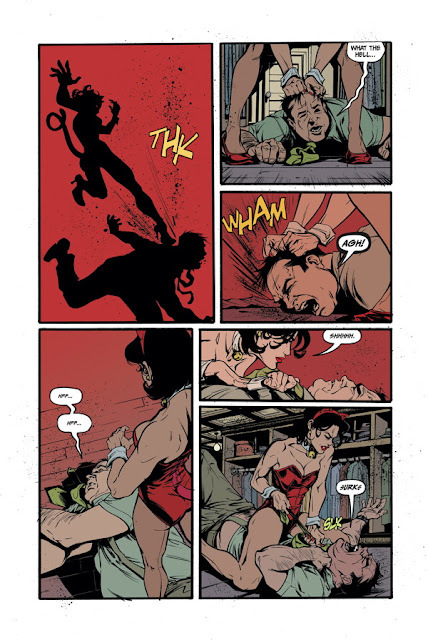 Between the demands of her family life (including her disapproving mother-in-law), the challenges of performing as a ruthless assassin, and being underestimated by the men she works for, how can she do it all - and make it look so good? Tonight, Josie's not having a great night. Somebody just won’t go away. Well one body, the body of the man she murdered to be exact. Damn it, here comes another man. Alive this time. The good news is that Mrs Schuller actually knows the guy, this is Irving. Apparently they met at the World’s Fair and I’m betting there’s a story there that we have yet to see. Anyway, Irving has an unexpected proposition for Mrs Schuller. He’ll do the disposal, if she’ll do the dispatching. Back in ‘normal’ life, hubby’s work is having a Christmas Barbecue on a Florida Beach, and an anonymous note requests Mrs S’s presence at the Surfside Playhouse. Isn’t that just bingo! What is she agreeing to? The next job, the first of the Schuller-Irving team working together, is an interesting one and plays on some of the stereotyping of 1960s sexism. It also makes you question just how many hats one pilot might keep. You really need to see the comic to understand why. Move over James Bond, America has a new Mata Hari. This series is turning into a really good romp. Yes it uses the sexism tropes of the 1960s, but usually to turn them on their heads, or at least to tip them over just a little bit. When I was a kid in the 70s, my mum was often making her own clothes and I remember that on a lot of the pattern packages the designs were just that, drawn designs for the outfit, and even then they often felt old fashioned, like an artist’s impression of what the 1960s should have been. By the way - there are still patterns sold in packages with those kind of designs. The reason I am seem to be going off topic with this is that the look of this comic does the same thing. It’s not just the situation that recreates that 60s feel, it’s the way the whole comic is drawn. I love it. It seems that every day there’s another death in Josie Schuller’s life and she barely bats a false eyelash at it. This woman is capable, intelligent and interesting. I want to know more of her secrets - not least of all - how does she get all the blood stains out? Once again, it's a good four out of five for this issue.